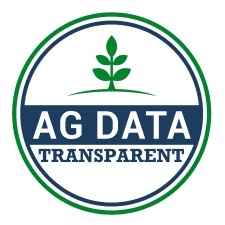 GROWMARK has become the first agricultural cooperative system to earn the “Ag Data Transparent” seal for ag technology providers, which recognizes GROWMARK for its transparency working with farmers and the standards of privacy and security of data. The Ag Data Transparency seal recognizes the GROWMARK System’s commitment to growers on how farm data is collected, where and how it’s stored and more. “When we work with our growers on collecting data, we want them to feel very confident that we’re going to protect their data,” said Lance Ruppert, GROWMARK director of agronomy marketing. The GROWMARK System’s MiField Applied Research initiative and FS AIS (Advanced Information Services) enterprise decision tool aid in the collection of field data that is then used to show successful management trends and assist with the development of agronomic recommendations. The evaluation and approval process considers many factors when assessing each company’s contracts with farmer data. The seal is awarded by an independent review organization comprised of industry groups, commodity organizations and ag technology providers known as the Ag Data Transparency Evaluator. This non-profit organization was created to give growers objective and clear insights into what data is being collected, who has access and who maintains ownership. More information is available at fb.org/agdatatransparent.